To set up your permissions, simply navigate to the Settings page. Once the page loads, select Access Permissions. It will then load up any existing access permissions. 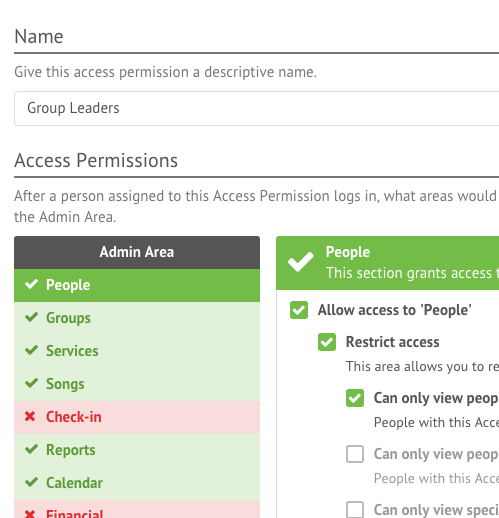 While editing an access permission, you can easily change permissions to the Member and Admin Area with a few clicks. After saving your access permissions, you can then assign them accordingly by editing each person individually in their profile (within their ‘Access Permissions’ field). You can also apply permissions via the mass manage tool and assign multiple permissions at once. People can be assigned more than one Access Permission, they are just overlapped to give the person more or less access (more on this below). How do I lockdown and restrict user access? To ensure the security of your account, it’s important understand the different ways you can lockdown and restrict users’ access to the different areas of the system. When editing an Access Permission, there is an option called ‘Lockdown Areas’. Here you can limit a user to only viewing information connected to specific locations, demographics or departments. This means things like people, groups, and services will be limited to the lockdowns you specify. There are two main ways you can apply lockdowns. Firstly, you can choose to lockdown based on specific areas assigned to a user. For example, if a user was assigned to your Central Campus location and the ‘Children’ demographic was ticked in their profile, if you chose in their access permissions to lock them down based on assigned locations and demographics, that user would only see children at your Central Campus. You can also opt to lock down people to areas they might not be assigned to, which could be helpful when setting permissions for people like your Children’s Pastor. For example, if your Pastor was locked down to the demographics they were assigned to (and your children’s pastor was in the adults demographic), they would not be able to view children. If you ticked ‘lock down based on select demographics’ and then ticked ‘Children’, however, they would then have access to that Children demographic. If a user has multiple access permissions, with different lockdowns in place, they will overwrite each other and the user is left with only lockdowns that the different access permissions in place. For example, if a user has an access permission locked down to their assigned location, and a second access permission locked down to a specific department, the two would overwrite each other and the user would then not be locked down to anything. Lockdown areas are only used in the Admin area. The Member area is locked down to the assigned location by default, with the exception of the Member Directory which can be customised. 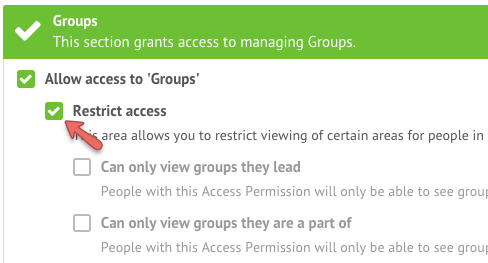 Under the People section of Access Permissions, there is the ability to restrict access to people. Unlike lockdowns, restrictions do not overwrite as easily. This option does exactly as the title says, and limits the user to viewing people within the groups they lead. Checking this option overrides other lockdowns set on a person, and allows users to view people in groups they lead that may not match the other lockdown criteria set for the user. An example of this could be if a group leader was locked down to your North location. If there was a person in the group they led from your Central location, this person would still be visible by the group leader. Similar to the ‘groups they lead’ lockdown, this option will lock down a user to viewing people within the groups they are a part of. Unlike the ‘groups they lead’ option above, though, this does take into account other lockdowns applied to the user’s account. An example of this could be if they are in a group and also locked down to Seniors demographic. If there was a person in their group who was assigned to the ‘Young Families’ demographic, the user would not be able to view that person in the system because of their lockdown. Similar to Lockdowns, this option locks a person’s viewing access to specific People Categories. You can restrict users to certain groups. This option limits a person to viewing the groups they are a leader of. This does not take into account any lockdowns and will allow users to view groups they lead that are outside of any other lockdowns in place. An example of this is could be if a group leader was locked down to your North location. If there was group they led that was connected to your Central location, it would still be visible to them. Similar to the ‘groups they lead’ lockdown, this will lock down a user to the groups they are a part of. Unlike the ‘groups they lead’ option above, however, this does take into account other lockdowns applied to the user. 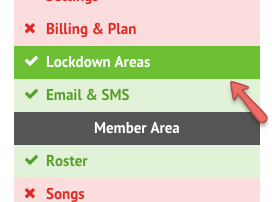 An example of this could be if a user was in a group and also locked down to the ‘Music Team’ department. If the group was assigned to the ‘Pastoral Care’ department, the user would not be able to view that group. There are certain situations where lockdowns and restrictions are overwritten. An example of this could be if a user was a part of two access permissions. If one access permission restricted a person to viewing groups they led and the other has unrestricted access to groups, the restriction would be ignored and the person could view all groups. Lockdowns however are over-written when one access permission is locked down to an area, but another isn’t locked down.